A few years ago the Supreme Court of the USA opened the monetary floodgates and this years presidential campaigns have seen billions of dollars spent to elect one person to a not very high paying job. 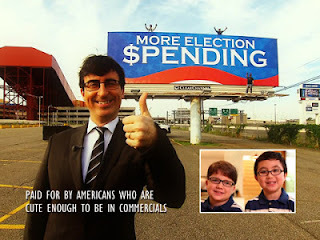 It makes you wonder if elections have become just another industry that makes a lot of money for the radio and television networks that air mudslinging ads as well as the 24x7 pundit industry that makes millions off analyzing and criticizing the candidates. Makes me want to stop watching and starve this industry a bit. Even so, could it be that the Election Industry is one of the few things that are really 'made in America these days?